No Minute today, but more Derek Lowe talk, in the form of a mock Q&A. 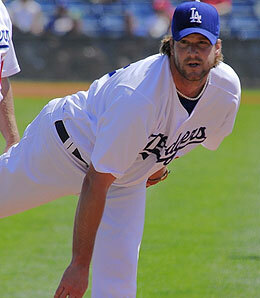 Question: Because the Phillies are looking at Derek Lowe, does that mean Jamie Moyer isn’t coming back? Not necessarily, but chances are probably not as hot. When the Phils declined to offer Moyer arbitration, they basically said “we’re paying you on our terms.” The Phils probably want Moyer at close to the $5.5M he made in 2008, while Moyer probably thinks he can get more. He can. Whether he’d want to with another team is another question. I think we will see movement with Moyer, and he will return to the Phillies for a price closer to what the team wants. What about Pat Burrell? If Lowe is signed, is Burrell gone? Yes. Unless Burrell wants to come back at $10M per year, but that’s not happening. The Phils don’t want to pay Burrell more than probably $14M or so, but by going after Lowe, they’re admitting they’d pay someone else more than $14M per year. Burrell should get better offers from the Angels and Giants. He’s all but gone. If no Burrell, then what? Could Brett Myers be on the trading block? This is possible. Myers is facing the final year of his contract, and the Phils might want to move him if they think they can sign Lowe. The Phils might be able to get a Jermaine Dye or Vernon Wells for Myers and a prospect or two (Jason Donald comes to mind first). Would I bet on it? No. Will the Phillies sign Derek Lowe? Tough to say. I’d bet the Phils will stick in it until the very end, but time is the main rival. If too much time passes on deals for CC Sabathia and AJ Burnett, the Phils might lose out. Most executives believe Lowe is the lowest risk of the big free agent arms, so if there’s too much of a waiting game, one team might swoop in and grab Lowe for a bigger pot. That team could be the Phils, but I see the Yankees and Mets as more likely big spenders. If the Phils sign Lowe, it’ll happen within the next two weeks.